Gunther’s Grass combines ancient acoustic instruments and electronic post-production into an enigmatic improvised dronescape, at once invoking an exotic and distant past with bluesy nostalgia, and a buzzing, electrical dystopian future. Gunther’s Grass is a collaboration between Marcelo Radulovich on the medieval hurdy-gurdy, a keyed string instrument bowed with a rotating metal disc, Christopher Adler on the khaen, a free-reed mouth organ from Laos, and Scott Walton on the contrabass. Gunther’s Grass is also joined by guest artists on selected tracks. Charles Curtis, virtuoso cellist and celebrated interpreter of works by La Monte Young and Alvin Lucier, brings to Automatic Writing and Hull intricately timed pulsations of justly-intoned double stops. And soundscape phonographer and electronic improviser Marcos Fernandez adds to Boat People the Indian sruti box, an electronic simulation of the droning tanpur. 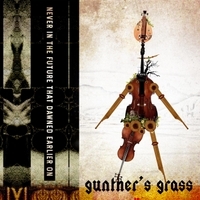 Gunther’s Grass performs live in San Diego, and recorded Never in the Future that Dawned Earlier On in 2005-06 at Titicacaman Studios, in Cardiff, California.